Well, we know who has replaced Panacea, Greek goddess of universal remedy: the cucumber. They’re delicious, yes, but cucumbers are so much more than just taste. Here are seven things that the supernatural cucumber does. 1. Is there more to cucumbers than just water? Cucumbers also contain Vitamins B1, B2, B3, B5, Folic Acid, Calcium, Vitamin C, Iron, Magnesium, Phosphorus, Potassium, and Zinc. All of these important nutrients to keep you healthy and happy. Cut up a cucumber and place it in a boiling pot of water. The chemicals and nutrients from the cucumber will react with the boiling water and be released in the steam, creating a calming and comforting aroma. 3. Had a few too many drinks last night? We’ve all been in your shoes. Cucumbers contain enough B vitamins, electrolytes, and sugar to replenish essential nutrients that alcohol absorbs from your body. 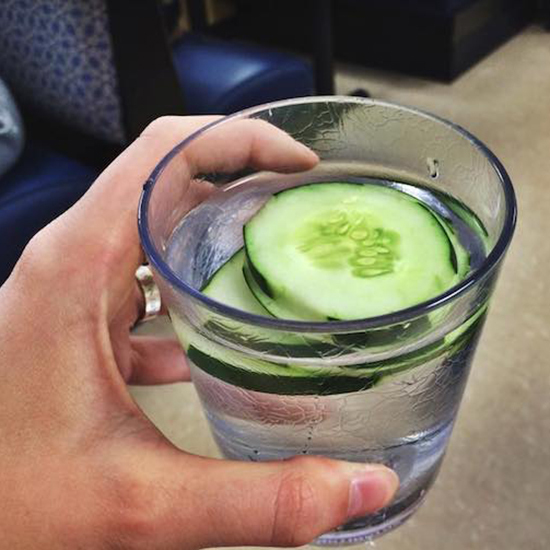 Say goodbye to morning hangovers after eating a cucumber before you go to sleep. 4. Need a pick-me-up after a long nap? Stay away from coffee and other caffeinated drinks and eat a cucumber instead. Cucumbers are chock-full of B vitamins and carbohydrates that can provide just the energy you need. 5. Want to give your bathroom a quick and easy clean? All you need is a slice of a cucumber to get rid of any tarnish or built-up residue. Take the slice and wipe it on any surface that needs some extra care. 6. Writing that dreaded essay with a pen and made a mistake? Have no fear, the cucumber is here. Take the peel and slowly erase away the pen writing. You’ll have a clean page in no time. 7. Struggling to stay hydrated during the day? Try snacking on some cucumbers. They are made up of 95% water and will help quench your thirst. Discover all 10 super-cool cucumber facts over at Spoon University.